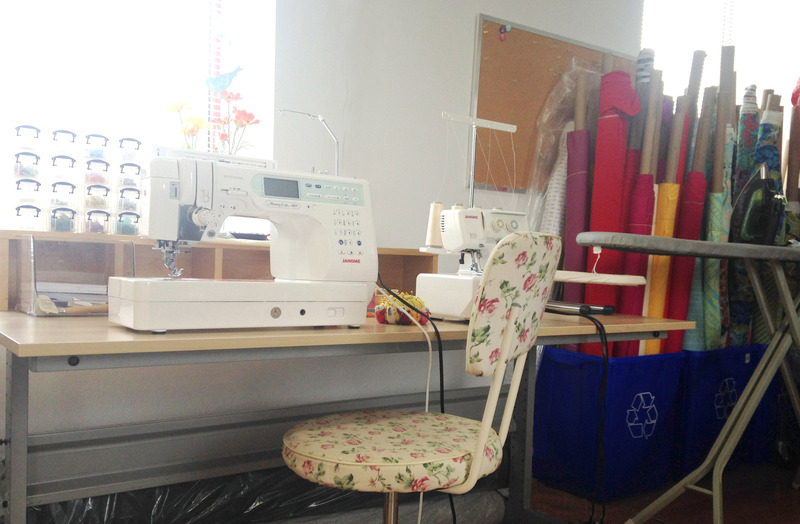 My new studio is a bright second-floor space on the Danforth that is bursting with colour. 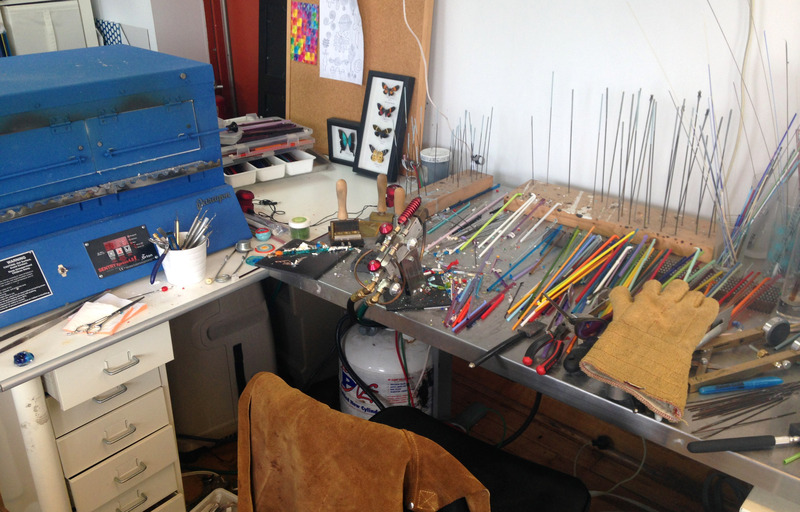 My studio mate Catherine of Sailorgirl Jewelry has been there on her own for years. I am ecstatic that she decided to share with me. Wanna see? Come on in! 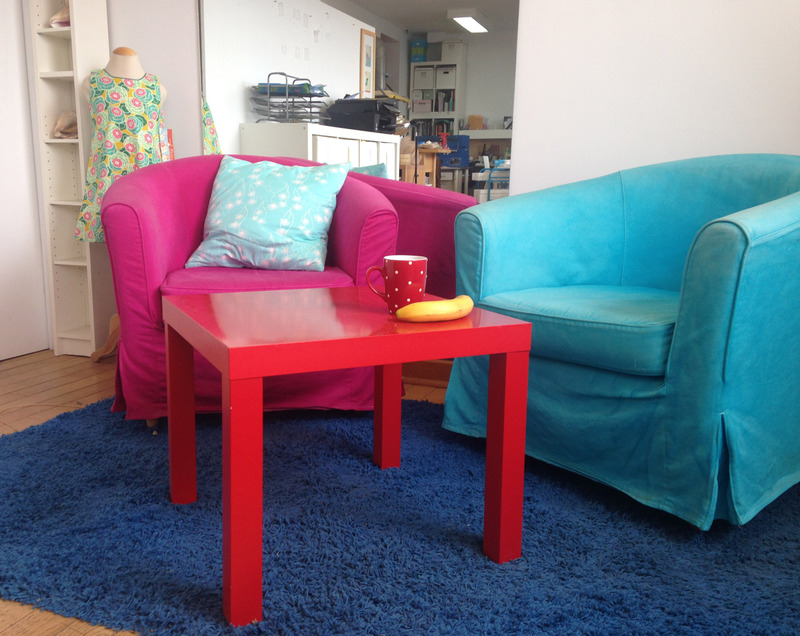 At the studio entrance there is a small lounge area for hanging out or enjoying a refreshing snack. This is the left half of the studio (my half) as seen from the lounge area at the front. The cutting table is where the work begins! That’s Catherine hard at work assembling jewelry on the right. The fabric is all in one corner. 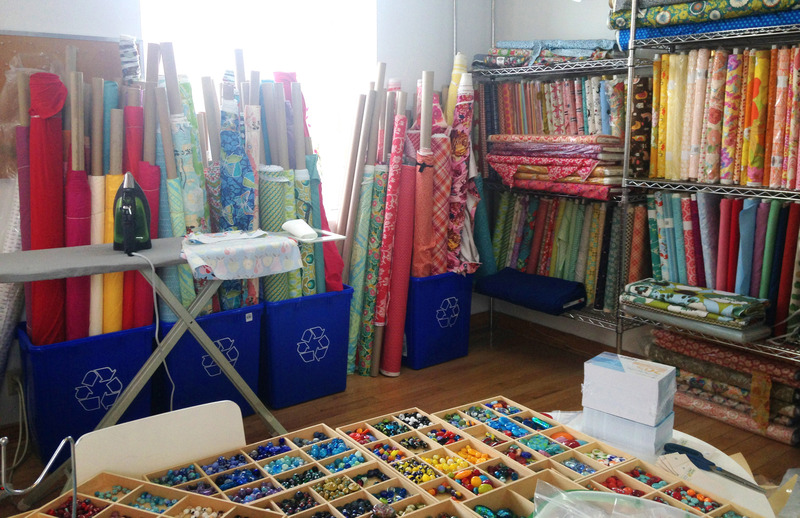 I am still bringing fabric (and clothing) in and figuring out how best to organize it, but it’s shaping up nicely. 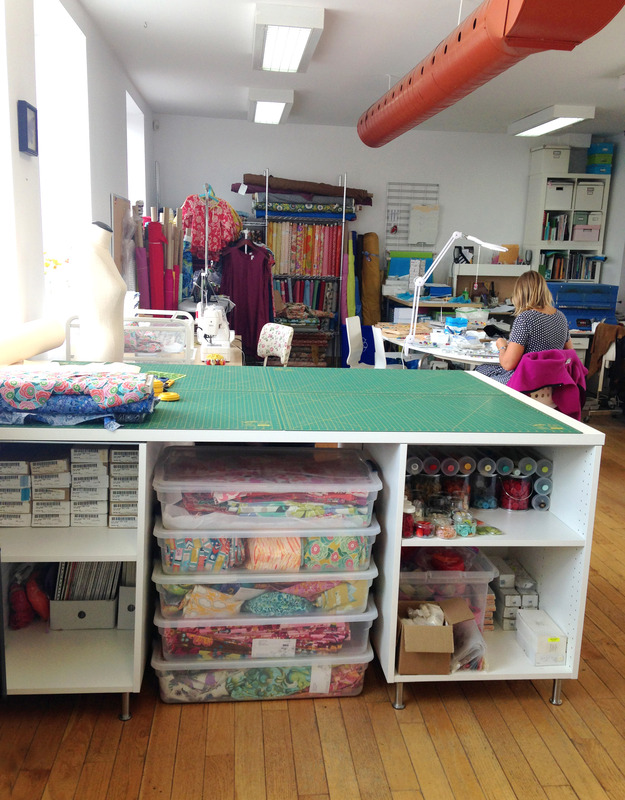 This photo was taken from Catherine’s workspace, behind her bead/assembly table. The colour (of the glass and fabric together) is scrumptious. Those glass beads look great, don’t they? Catherine makes every one using coloured glass rods and a propane torch. The blue kiln on the left is where the glass anneals. The process is very cool to watch. The machines haven’t seen too much action here yet, as I’m just starting to work in the space. But I am very excited about ‘going to work’ in the morning, sewing up a storm, and then leaving it all behind at the end of the day. This is a very novel concept for me! Is that everything? Nope. There’s a little kitchen full of treats, a small bathroom, a printing/shipping area, a photography corner… this is a wonderful space and I feel very happy to be here. If you’d like to drop by for a visit or to shop, you’re most welcome. I don’t have set hours yet, but am happy to meet by appointment. And in case you’re wondering, I will not be holding sewing classes for kids in this space, those will remain in my home (along with sewing camp). But I will hold a few workshops for adults at the studio shortly, to test it out, and I suspect it will be a pleasure to teach and learn here. If you want to come over, just send me an email for exact directions, I’d love to see you!